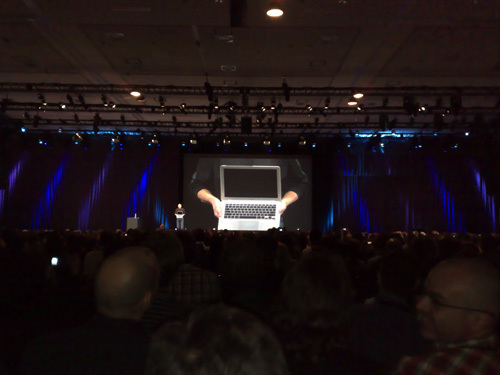 it’s true now, the thinnest macbook ever will come true. it’s no longer a rumour. 1.6 / 1.8 Ghz Core 2 Duo – iPhone like Multitouch – GREAT!!! Remote Disc: Use another DVD of another mac possible. DVI for Monitor, LED BAcklit, Firewire??? seems no..!?!? 5hrs batteries – I assume that means 3hrs in reality ;) as always..
__ Now the real prices – who cares about USD over here?.. Mit 1.699 Euro kostet das kleine MacBook Air, 2.868 kostet das Gerät in der Top-Austattung mit SDD als Festplatte. Updates.. Partypics 4.8. / 28.7.